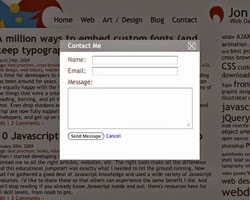 Div Popups are usually used on web pages to display enlarged Images or data capturing forms like contact or feedback. Instead of showing the data on a new window popup, we can use DIV element to display the same with out loading on a separate popup. There are lots of JS libraries to add effects on your web page. Some times you may want to add a simple Lightbox to your page. For doing this instead of adding a 300kb JS library, you can do it with simple JS and CSS code. Below given is a simple HTML page which displays a lightbox. no complicated codes are there to confuse you. There are few linkes of CSS declarations and few JS codes to trigger the light box and to close it. Save the below given code as lightbox.html and open it our browser. black_overlay class is the layer that will make the web page seem to fade.